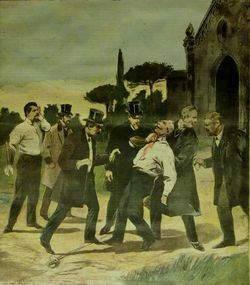 In the decades following the Unification of Italy (1861) Unità, in contrast with what happens in the rest of Europe, the recourse to the duel in Italy intensifies and spreads, finding cultural legitimacy and a broad media echo. The exhibition intends to recount some moments of the forgotten history of this "institution" which, founded on knightly laws and codes of honor of ancient tradition, resists until the Great War and the Fascist decades, providing for a long time the new ruling class with myths and identity rites, which find frequent expression in literature and theatre. The virtual version of this exhibition, also outcome of the project, will be created in the collaboration with the Humanities Library and will be published in the spring of 2019.